The Sensefolio’s algorithm considers companies’ reports as well. It skims through each of their ‘Sustainability’ reports, ‘Environmental, Social and Governance (ESG)’ reports, or simply their ‘Annual’ reports, as well as companies’ earnings call transcripts, and applies an internal Natural Language Processing (NLP) algorithm to assess the companies’ degrees of involvement into social, environmental and governance topics defined by Sensefolio. The Sensefolio’s algorithm takes into account companies’ reports as well. It skims through each of their ‘Sustainability’ reports, ‘Environmental, Social and Governance (ESG)’ reports, or simply their ‘Annual’ reports, as well as companies’ earnings call transcripts, and applies an internal Natural Language Processing (NLP) algorithm to assess the companies’ degrees of involvement into social, environmental and governance topics defined by Sensefolio. Companies from the largest indices are currently covered by Sensefolio. This includes over 10,000 companies with a global coverage of over 50 countries. Below are a few examples of reports that companies can release to disclose their commitments to ESG. They can be either ‘ESG’ reports, ‘Sustainability’ reports, or the information can be contained in the companies’ ‘annual reports’ as well. Sensefolio is programmed to intercept and read every new report being published by a company. 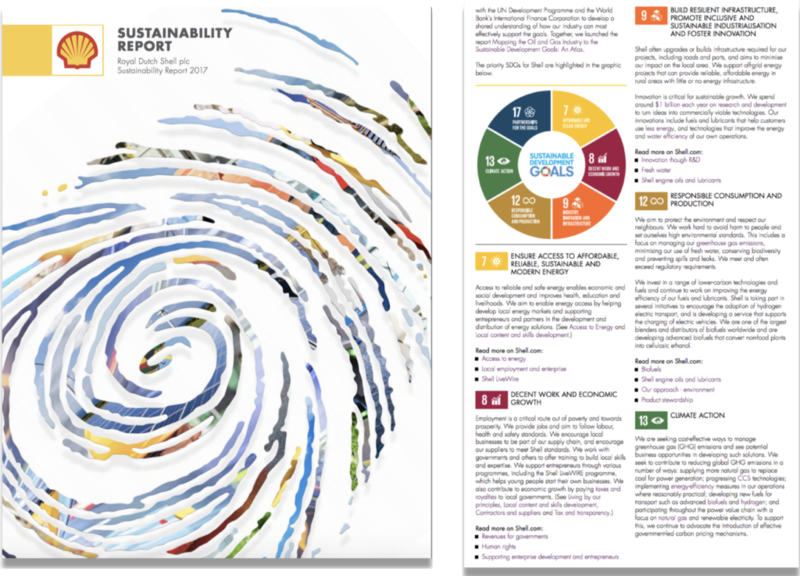 They can be named ESG report (as seen on A), Sustainability report (as seen on B), or CSR report (as seen on C). Text is then read and analysed to be integrated and add new information into Sensefolio’s existing or new companies’ scores. Internal NLP algorithms are used to assess the degree of companies’ commitment to ESG topics as well as the objectivity and subjectivity of the text corpus. 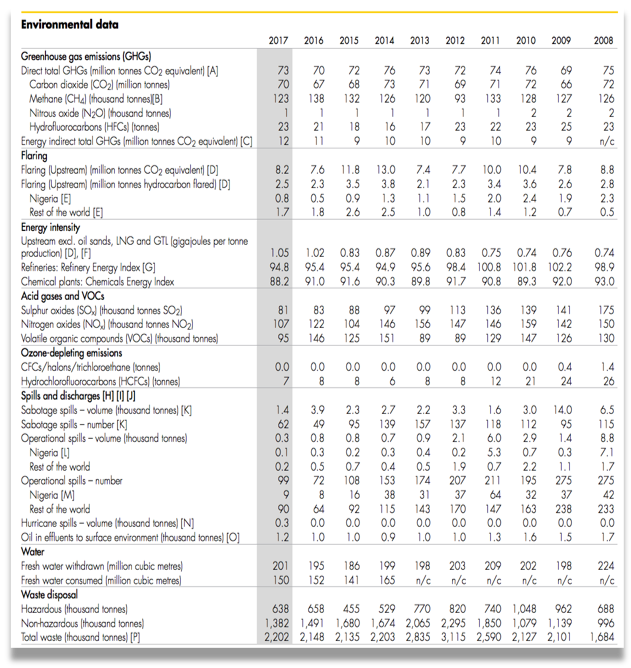 As shown in Exhibit 2, Shell discloses in its Sustainability Report how it is responding and act according to their relevant United Nations Sustainable Development Goals (SDGs); ie. Ensuring access to affordable, reliable, sustainable, and modern energy, decent work and economic growth, building resilient infrastructure, promoting inclusive and sustainable industrialisation and fostering innovation, having a responsible consumption and production, as well as the climate action(s) they are taking. In this same report, Shell also discloses their environmental data which are all scrutinized and evaluated by the Sensefolio algorithm. Sensefolio includes earnings calls to its “Financial Report and Earnings Calls” pillar. Executives are generally CEOs and CFOs. 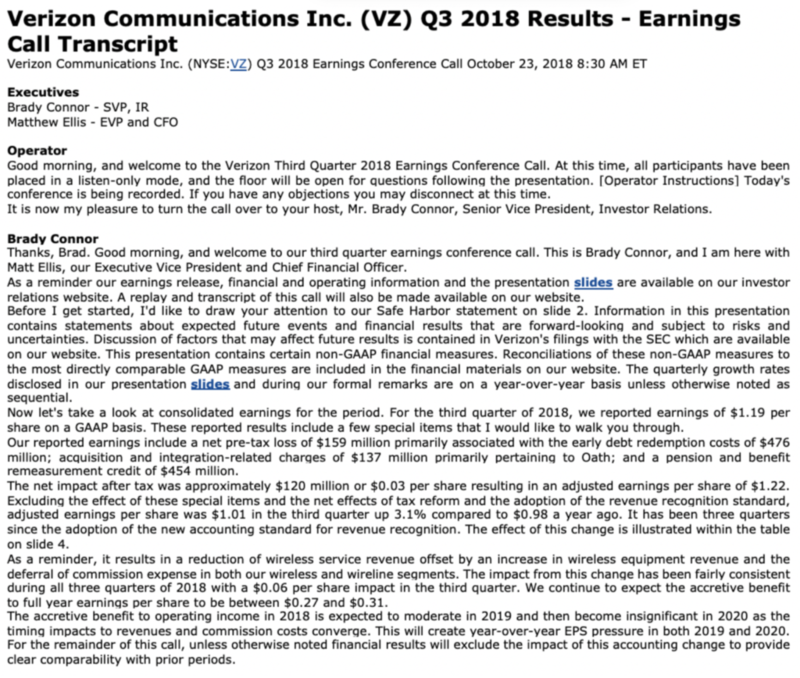 Exhibit 3 shows an example of a recent Earnings Call transcript of Verizon Communications Inc. made for the company’s Q3 2018 results. Reading earnings call transcripts adds more information into the Sensefolio scores as our algorithms can assess and monitor both sentiment-based signals as well as behavioural-based signals. Sensefolio utilizes the Gunning fog index, which is a readability test for English writing. The index estimates the years of formal education a person needs to understand the text on the first reading. The index takes into account the average words per sentence, as well as the number of complex words in a call. The “complex” words consist of three or more syllables without including proper nouns, familiar jargons, or compound words. As an example, a fog index of 12 would require the reading level of a US high school senior (i.e. Around 18 years old). Sensefolio considers the analyst favouritism into its model. Indeed, companies might select the most bullish analysts to ask questions in order to hide their results and show a more optimistic view of the company prospects to others. Finally, Sensefolio counts how many numerical values are presented during the earnings call. The more numerical values are presented, the more likely the executives want to conceal the unfavourable future of the company.